Auburn is a city in and the county seat of Androscoggin County, Maine, United States. The population was 23,055 at the 2010 census. Auburn and Lewiston (directly across the Androscoggin River) are known locally as the Twin Cities or Lewiston-Auburn (L-A). The area was originally part of the Pejepscot Purchase, land bought in 1714 by a consortium from Boston and Portsmouth following the Treaty of Portsmouth, which brought peace between the Abenaki Indians and English settlements. In 1736, however, the Massachusetts General Court granted a large section of the land to veterans of the 1690 Battle of Quebec. Conflicting claims led to prolonged litigation; consequently, settlement was delayed until after the French and Indian Wars. 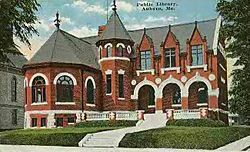 Auburn was first settled in 1786 as part of Bakerstown, renamed Poland when it was incorporated by the Massachusetts General Court in 1795. It was then part of Minot, set off from Poland and incorporated in 1802. Auburn would itself be set off and incorporated on February 24, 1842. The name was apparently inspired by "Auburn", a village (real or fictitious) featured in the 1770 poem "The Deserted Village" by Oliver Goldsmith. Originally part of Cumberland County, the town became county seat of Androscoggin County at its creation in 1854. 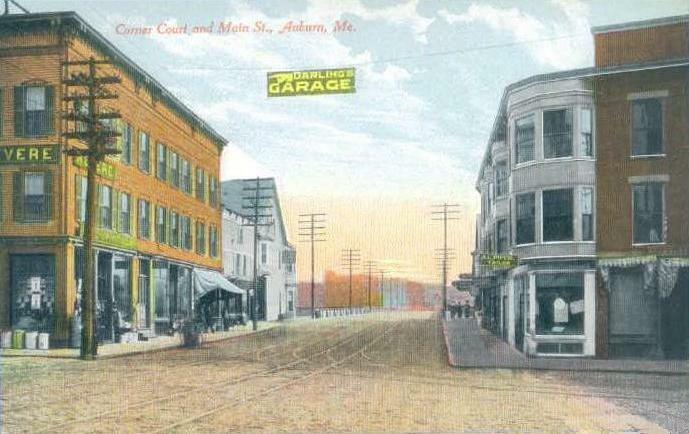 By annexing land from towns around it, including part of Poland in 1852, Minot in 1873, and all of Danville (first called Pejepscot) in 1867, Auburn grew geographically into one of Maine's largest municipalities. 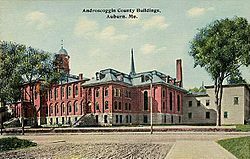 Incorporated a city in 1868, Auburn in 1917 would be the first city in the state to adopt a council-manager form of government. Farms supplied grain and produce, but with construction of the bridge to Lewiston in 1823, and especially after arrival of the Atlantic and St. Lawrence Railroad from Portland in January 1848, the community developed into a mill town. Mills were built to operate by water power from falls on the Androscoggin River and Little Androscoggin River. In 1835, the factory system of shoe manufacture originated at Auburn. Other firms manufactured cotton and woolen textiles, carriages, iron goods, bricks and furniture. The population in 1860 was only about 4,000 but by 1890 it was about 12,000, when its shoe factories attracted many French Canadian immigrants, many of whom arrived by train from Quebec. Steady population growth continued to about 1960 when the population was about 24,500. In Auburn, shoe manufacturing became the dominant industry by the late 19th century. The City Seal, depicting a spindle with different types of shoes at each outside point, was designed when Auburn was positioning itself as the shoe manufacturing center of Maine in the mid-19th century. In 1917 one factory in Auburn was producing 75 percent of the world's supply of white canvas shoes; however, after World War II the shoe industry began to decline, and between 1957 and 1961 the largest manufacturers closed their factories. 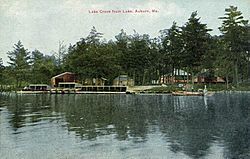 In 1937, one of the largest labor disputes in Maine history occurred in Lewiston and Auburn. The Lewiston-Auburn Shoe Strike lasted from March to June and at its peak involved 4,000 to 5,000 workers on strike. After workers attempted to march across the Androscoggin River from Lewiston to Auburn, Governor Lewis Barrows sent in the Maine Army National Guard. Some labor leaders, CIO Secretary Powers Hapgood, were imprisoned for months after a Maine Supreme Judicial Court judge issued an injunction seeking to end the strike. Auburn is located at (44.089, −70.241). According to the United States Census Bureau, the city has a total area of 65.74 square miles (170.27 km2), of which 59.33 square miles (153.66 km2) is land and 6.41 square miles (16.60 km2) is water. Auburn is drained by the Little Androscoggin River and Androscoggin River. 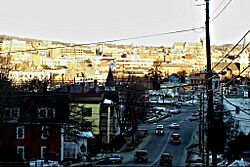 Auburn is one of two principal cities of and included in the Lewiston-Auburn, Maine metropolitan New England city and town area and the Lewiston-Auburn, Maine Metropolitan Statistical Area (which is part of the Portland-Lewiston-South Portland, Maine combined statistical area). As of the census of 2010, there were 23,055 people, 9,974 households, and 5,818 families residing in the city. The population density was 388.6 inhabitants per square mile (150.0/km2). There were 11,016 housing units at an average density of 185.7 per square mile (71.7/km2). The racial makeup of the city was 93.7% White, 2.5% African American, 0.4% Native American, 0.9% Asian, 0.3% from other races, and 2.1% from two or more races. Hispanic or Latino of any race were 1.5% of the population. There were 9,974 households of which 29.1% had children under the age of 18 living with them, 39.9% were married couples living together, 13.0% had a female householder with no husband present, 5.4% had a male householder with no wife present, and 41.7% were non-families. 32.0% of all households were made up of individuals and 12.8% had someone living alone who was 65 years of age or older. The average household size was 2.26 and the average family size was 2.84. The median age in the city was 39.9 years. 22.1% of residents were under the age of 18; 8.6% were between the ages of 18 and 24; 26.1% were from 25 to 44; 27.9% were from 45 to 64; and 15.2% were 65 years of age or older. The gender makeup of the city was 48.3% male and 51.7% female. As of the census of 2000, there were 23,203 people, 9,764 households, and 5,907 families residing in the city. The population density was 388.1 people per square mile (149.9/km²). There were 10,608 housing units at an average density of 177.4 per square mile (68.5/km²). The racial makeup of the city was 97.04% White, 0.59% African American, 0.30% Native American, 0.59% Asian, 0.05% Pacific Islander, 0.10% from other races, and 1.32% from two or more races. Hispanic or Latino of any race were 0.73% of the population. There were 9,764 households out of which 29.4% had children under the age of 18 living with them, 44.9% were married couples living together, 11.6% had a female householder with no husband present, and 39.5% were non-families. 32.0% of all households were made up of individuals and 13.2% had someone living alone who was 65 years of age or older. The average household size was 2.28 and the average family size was 2.88. In the city, the population was spread out with 23.2% under the age of 18, 8.1% from 18 to 24, 29.3% from 25 to 44, 22.2% from 45 to 64, and 17.1% who were 65 years of age or older. The median age was 38 years. For every 100 females there were 90.5 males. For every 100 females age 18 and over, there were 86.9 males. The median income for a six households in the city was $35,652, and the median income for a family was $44,012. Males had a median income of $32,088 versus $22,349 for females. The per capita income for the city was $19,942. About 9.0% of families and 12.0% of the population were below the poverty line, including 16.6% of those under age 18 and 11.8% of those age 65 or over. Auburn is the home of the Auburn-Lewiston Airport. It is off of Hotel Road. The Springfield Terminal is the main rail of the city. It mostly stays next to US Route 202. Although, that is not the only one. The St. Lawrence and Atlantic rail also flows through the city. The St. Lawrence and Atlantic rail also goes by the Auburn-Lewiston Airport and splits into north, east, and south directions. Festival Plaza, completed in 2002—public park and performance space along the Androscoggin River. Two public water sculptures designed by artist Ross Miller operate seasonally – the Falls Fountain, that references the Androscoggin River and Native American legends of being able to hide behind the falls; and the Shoe Fountain, a series of cast bronze shoes recalling the early shoe manufacturing history of the area. A map of the Androscoggin River is cast into the plaza with colored concrete. Auburn, Maine Facts for Kids. Kiddle Encyclopedia.